These final three films in my Godzilla-thon are, in my opinion, all perfect A+ movies. These three movies range from deep thought-provoking tales about the horrors of nuclear aggression, to an emotional and uplifting film with superb storytelling, to one of the most exciting and fun movies I’ve ever seen. Each of them is a masterpiece in their own way and it is almost impossible for me to pick one of them over the other. In that case, this comes down to my choice of favorites and which film leaves a bigger impact on me. 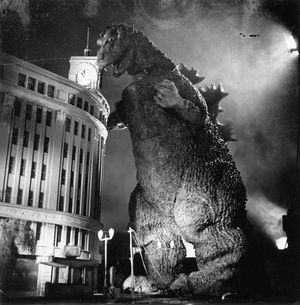 Which is why the original 1954 “Godzilla” only comes in at number three on my countdown. Make no mistake – the first Godzilla is not only the most important film in the franchise, but the most important daikaiju film ever made. It basically created an entire genre and style of filmmaking. 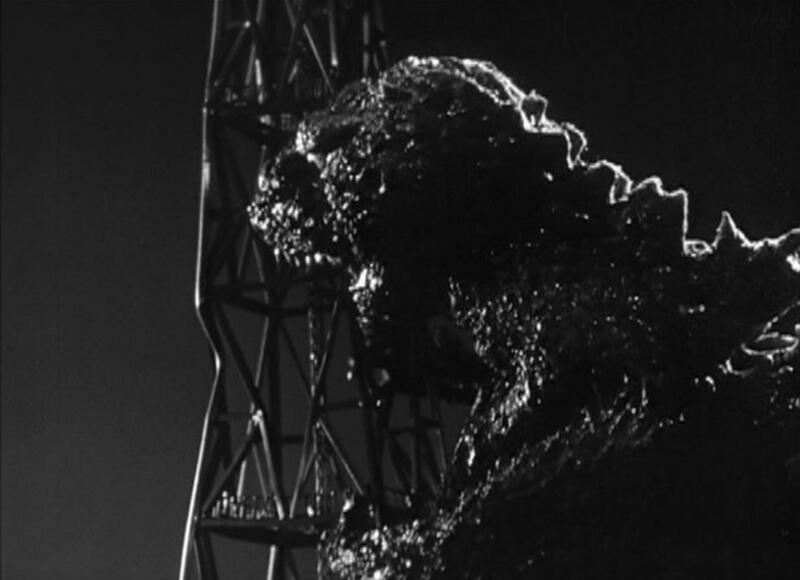 And while that genre has been diluted and changed over the years, “Godzilla” remains just as shocking and poignant today as it was in 1954. This is the “Citizen Kane” of giant monster movies, transcending its genre to be a great movie in general. Part of the reason “Godzilla” still holds up today is, like “Shin Godzilla,” because of the focus on Japanese identity and its people. When this film came out, Japan was still healing from their defeat in World War II. The government was in shambles, major cities were still being rebuilt from the ground up, and they had a genuine fear after having two atomic bombs dropped on them. The Japanese people were broken at this time, still searching for their new identity in this world. “Godzilla” emphasizes this by taking its monster attacking the city concept, but turns it on its head – Instead of being about the monster, it’s about the city and the people being stomped and burned by the monster. 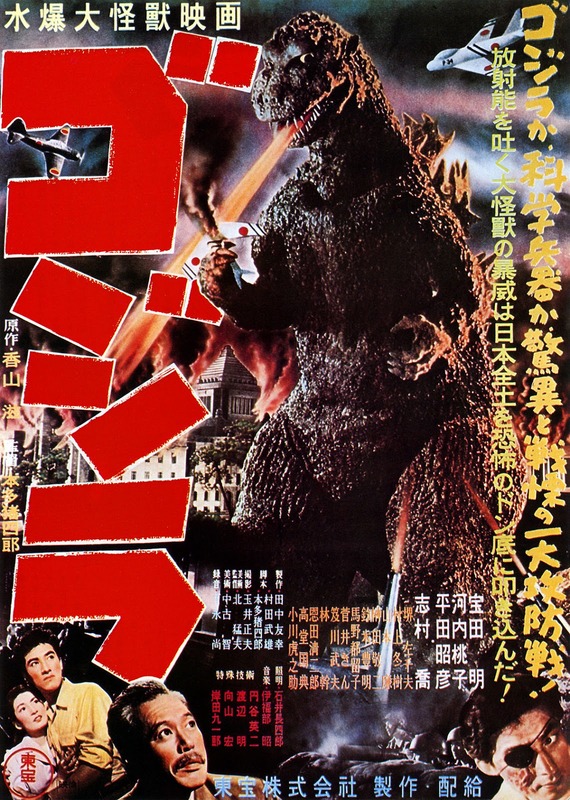 Some of the most powerful moments in this movie are smaller moments that show individuals reacting to Godzilla, including shots of people looking up at Godzilla from inside their apartment complex just as the monster destroys the entire building without a second thought, or the brave firefighters attempt to put out Godzilla’s radioactive flames but end up being surrounded by a sea of fire, or the survivors of Godzilla’s attack watching helplessly as the monster tears apart their city, yet cheering their hearts out when fighter jets arrive to drive Godzilla away. Even from the opening of the film, this focus on Japan’s reaction to the terror is brought into the light. “Godzilla” opens with a fishing ship bursting into flames and sinking into the ocean. As soon as the Japanese officials find out about this, they send out another ship to investigate, only for that boat to be destroyed in the same way. Their headquarters are crowded with the families and loved ones of those who were on those ships, hoping, and waiting to hear news about the fate of the crewmen. When they get word there were two survivors, the room is sent into a state of panic, everyone hoping that its their loved ones that made it out alive. Not a lot of focus is put on these grieving widows and loved ones, but it is enough to make a point that this is a tale about people coming to terms with the horror that they now face. But the big sticking point in “Godzilla” is its focus on nuclear weapons. Not only is Godzilla awoken from his slumber by hydrogen bomb testing, but he has been transformed by the bomb, mutated to a point no creature should be able to withstand, yet he has survived. Godzilla’s design screams of pain, from the many tiny bumps and wrinkles on his skin that suggests being burned and scarred by the blast, to his amalgamation of many dinosaurs, complete with creepy piercing yet unblinking white eyes. 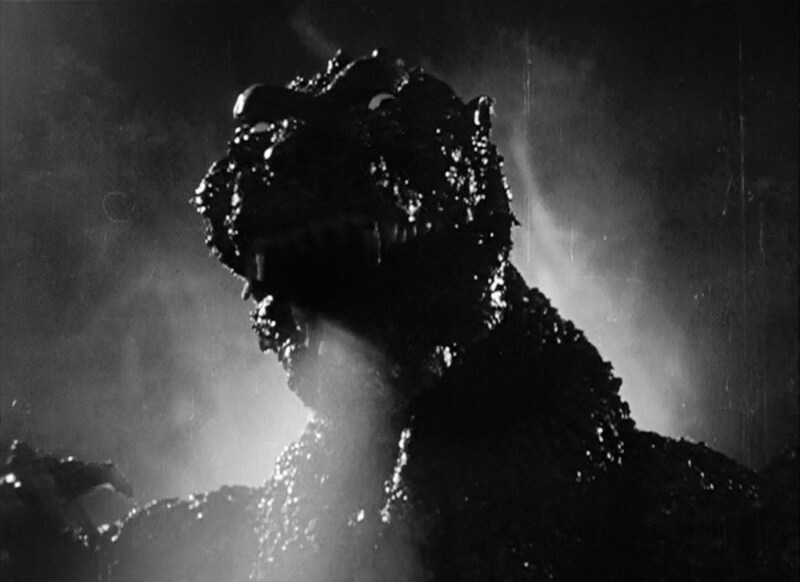 On top of that, Godzilla is a physical manifestation of the atomic bomb. He is indestructible, cold, uncaring, and kills without prejudice or intent. Anything he touches is reduced to rubble or ash, contaminated with radiation that would kill everything else. You cannot fight it or reason with it, and all he leaves is a massive wave of destruction. You’re only hope against something like this is run, but even then you probably can’t run fast enough. This makes his rampage through Tokyo one of the most chilling scenes I’ve ever seen, as the living atomic bomb tears through the city without remorse or feelings. 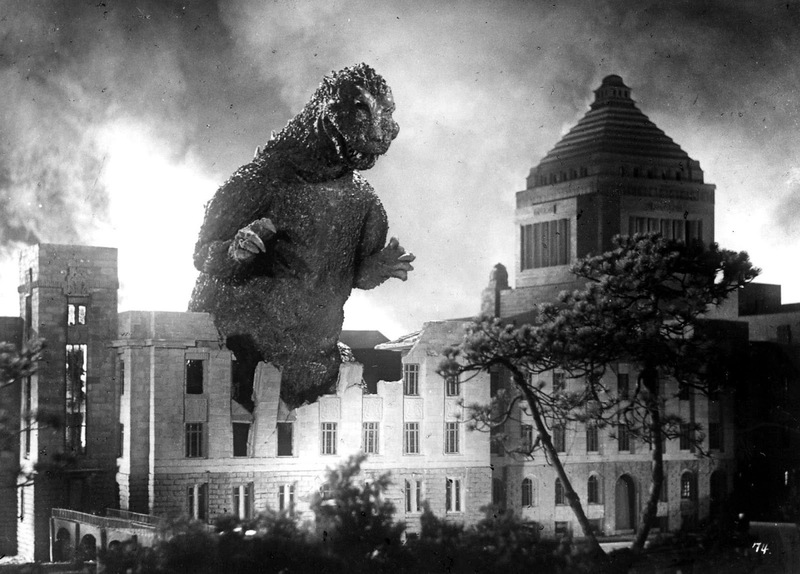 Eiji Tsuburaya’s special effects almost make this scene look like a documentary as Godzilla bites into the side of a tower with news reporters on it, watching them fall to their deaths while Tokyo burns. All the excitement and thrill of monster destruction is replaced with fear and sympathy in this scene, as we bare witness to a society’s obliteration. “Godzilla” sheds a different light on nuclear weapons though. It’s one thing to say that all atomic weapons are bad and should be destroyed, but “Godzilla” takes it a step further with the character of Dr. Serizawa (Akihiko Hirata), who has developed a weapon that is stronger than a hydrogen bomb, the Oxygen Destroyer. Serizawa uses his creation to make an interesting point – man will always try to create a more efficient killing machine at whatever cost. This led to the creation of mustard gas in the first World War, then to nuclear weapons in the second world war, and that led to Godzilla’s creation. We will always look for ways to pervert science to the benefit of weaponry and killing our fellow man, which is why Serizawa is so reluctant to hand over the Oxygen Destroyer to the rest of the world. This not only makes “Godzilla” a sympathetic portrait of Japanese society, but a poignant film about the escalation of our weaponry, always attempting to make a bigger and better bomb than before. And the point of the movie is that we’re now paying for that aggression and inherent destruction with a living incarnation of those weapons destroying us.